Three nights after my wonderful wife, Teresa, went to be with the Lord after suddenly and tragically passing away before my eyes on that beautiful evening on April 19, 2004, I was at the funeral home greeting friends and family, accepting their sympathy and slowly succumbing to the early stages of a grief that was dulling my senses. I have very little memory of that night, and even less of the following day of visiting prior to the finality of the funeral for my wife and best friend, the mother of my infant daughter, Melody. On that first evening at the funeral home, a young lady came up to me, introduced herself as one of Teresa's co-workers, a teacher at Reservoir high school, named Sara. We spoke no more than a moment, and she handed me a book. She offered her condolences, told me how much wisdom, advice, and friendship Teresa had provided to her, and explained that she had lost her fiance just over 2 years ago in a tragic accident involving a drunk driver. She had since met someone else, and was engaged again, and she told me that Teresa had told her how, when she and I were engaged, we began reading the first 100 Psalms in reverse order, a hundred days before our wedding, counting them down each day so that we read the First Psalm following our wedding ceremony. Sara and her new fiance were doing the very same thing. She then told me about the book. She said it had provided so much help to her as she was going through the throes of grief following her fiance's death, and the advice in it had made such an impact, she wanted me to have it. I thanked Sara and wished her well. 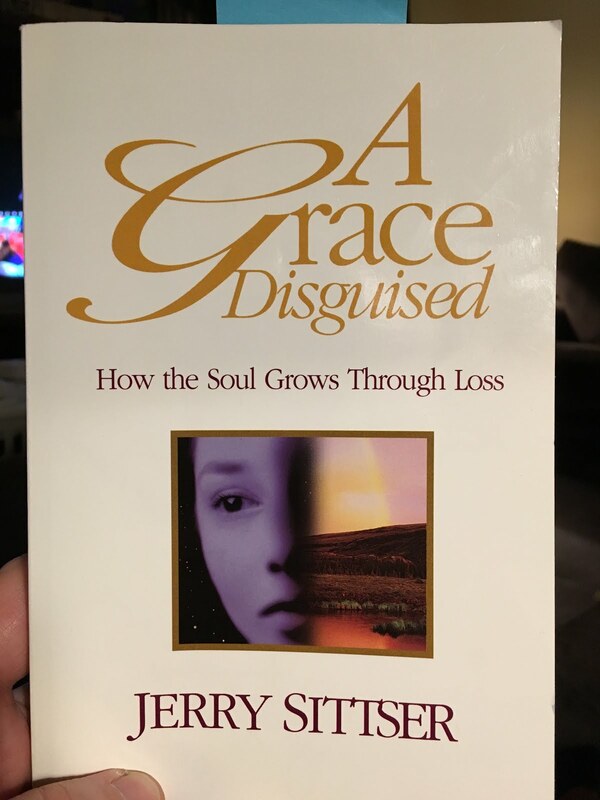 "I hope this book brings understanding to your heart, a friend to share in the sorrow, and the reminder of the amazing hope we have in Christ as our souls grow because of grief. You're in my prayers. To God's Glory, Sara Z"
Inside was a card of condolence from Sara to me, and inside she had written about the details of her fiance's death, her own walk with the Lord through grief, and how the author's words had provided a friend she could turn to for advice. She wanted me to know how helpful the book was to her, and that she hoped I could find the same. She said she would pray for me. After I read the card, I began to sob, and I wished I had talked with her more. The book turned out to be an amazing source of comfort and advice, and I have since recommended it to so many others who have experienced similar loss. The advice in the book would be helpful to anyone suffering from any kind of loss, from divorce, illness, or the death of a loved one. I can't recommend it enough. Sara, if you're reading this, thank you again for your thoughtfulness. The book was an immense help to me, and I appreciate the gift so much. Have a great evening, everyone. Please check us out on Social Media! Matthew 16:23 - "But he turned and said to Peter, 'Get behind me, Satan! You are a hindrance to me. For you are not setting your mind on the things of God, but on the things of man.'" Isaiah 41:10 - "So do not fear, for I am with you; do not be dismayed, for I am your God. I will strengthen you and help you; I will uphold you with my righteous right hand." 1 Peter 5:10 - "And the God of all grace, who called you to his eternal glory in Christ, after you have suffered a little while, will himself restore you and make you strong, firm and steadfast." 1 Thessalonians 4:13 - "But we do not want you to be uninformed, brothers, about those who are asleep, that you may not grieve as others do who have no hope." Titus 2:7-8 - "In everything set them an example by doing what is good. In your teaching show integrity, seriousness and soundness of speech that cannot be condemned, so that those who oppose you may be ashamed because they have nothing bad to say about us." John 15:13 - "Greater love has no one than this, that he lay down his life for his friends." Joshua 24:15 - "As for me and my house, we will serve the Lord." James 1:2-4 - "Consider it pure joy, my brothers, whenever you face trials of many kinds, because you know that the testing of your faith develops perseverance. Perseverance must finish its work so that you may be mature and complete, not lacking anything." Philippians 4:8 - "Finally, brothers and sisters, whatever is true, whatever is noble, whatever is right, whatever is pure, whatever is lovely, whatever is admirable—if anything is excellent or praiseworthy—think about such things." Luke 2:14 - "Glory to God in the highest, and on earth peace, good will toward men." "The ultimate measure of a man is not where he stands in moments of comfort and convenience, but where he stands at times of challenge and controversy." - Martin Luther King, Jr.
Joe: Are you used to this? Joe: Where would you go? Patricia: Away from the things of man. Pictures used on this site are copyright © of their respective owners and will be removed upon request. Copyright © 2008-2019 by Eric Freed. All Rights Reserved. Awesome Inc. theme. Powered by Blogger.